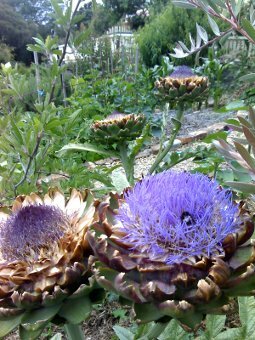 To see some of our FIMBY gardens developing over time, please see our Garden Evolution page. 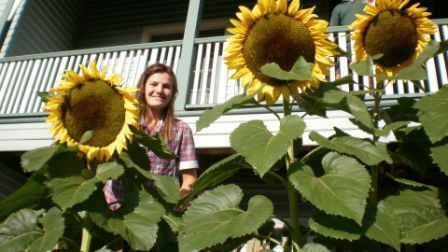 This gorgeous sunflower below brought to you by Vanessa in collaboration with soil, sunlight and water! We're in the process of re-arranging our photos so its easier to browse around and be inspired. Pleaes bear with us as we work through the technical stuff! We have the following photo albums to check out. Many of these are also currently shown in the table below. We'll be transitioning to all photo albums, but have doubled up just for now! 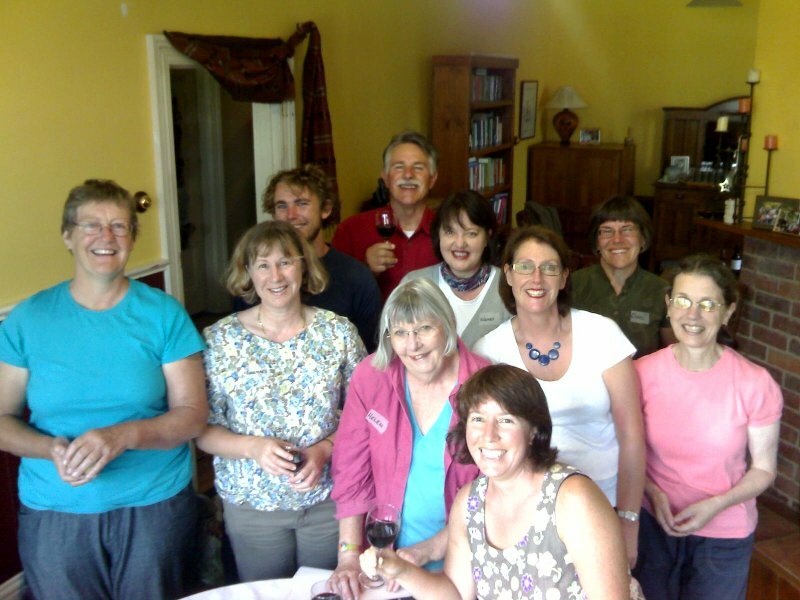 Here are some more pics of FIMBY people, gardens and vegies. Enjoy! Bandicooting the first new potatos for our FIMBY feast. Christmas morning harvest, for making spicy and pungent bouquets! At Jodie and Brendan's the kids got stuck into it! 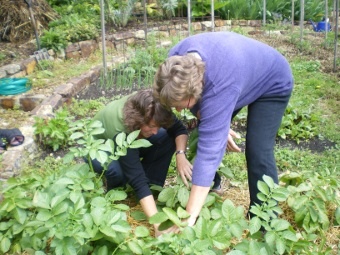 After all the heavy work, Charlotte shows great delicacy planting broad beans! 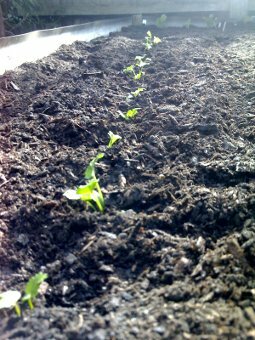 The first developing vegies are eagerly watched. 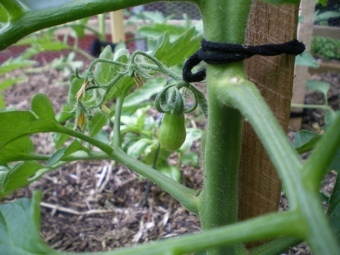 A well trained baby red fig tomato. Wendy and Thomas's psychedelic planting! 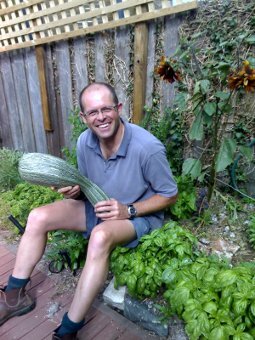 Dave with his enormous marrow. Nice basil too! 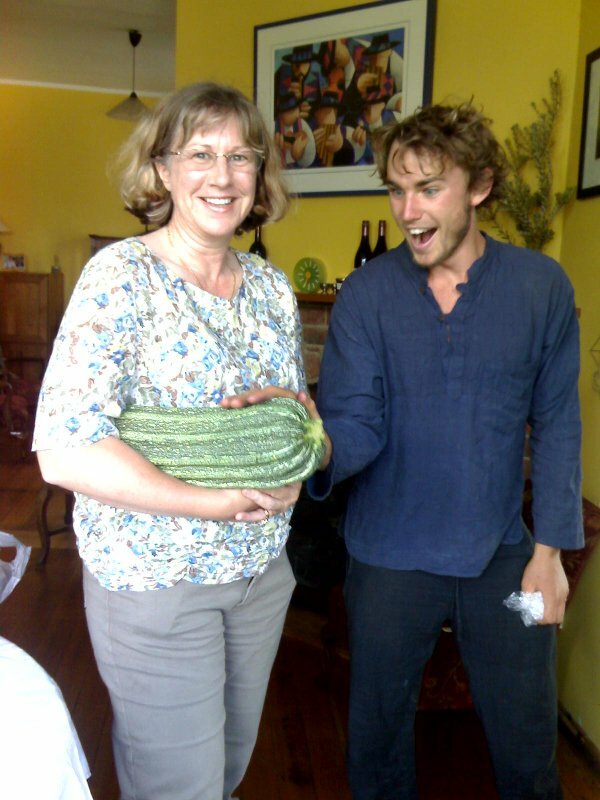 Dave with his big squash. Theme here? A developing prize! This ones a bit shy, hiding behind leaves. Kirsten and Paul grew a Dr Suess kale. Rosemary's beautiful healthy snow peas. 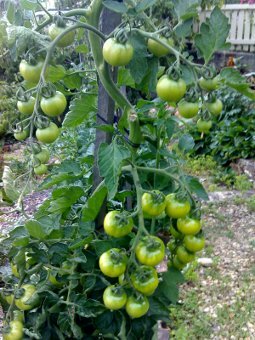 The toms are taking ages to ripen this year (Feb 2009), just starting to get some at last. 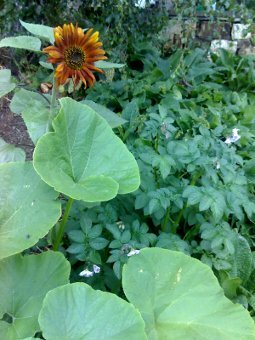 Self sown sunflower, pumpkin, spuds near the compost heap. Workin' hard at Jo's place, Parattah David's way of keeping the cats off baby carrots. 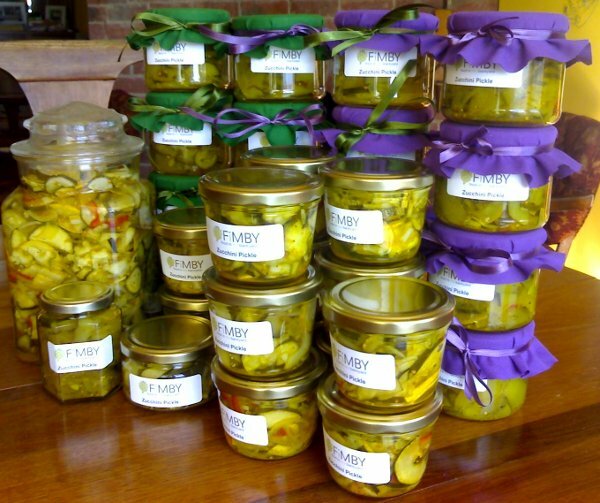 We came, we saw, we pickled! 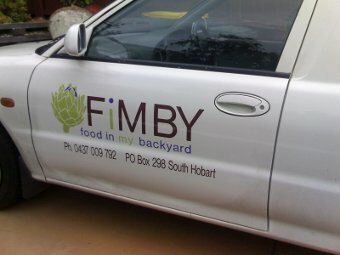 Honk if you love FIMBY. 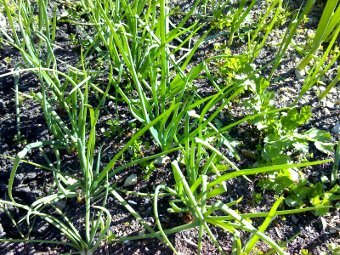 Shallots, coriander, spring onions look good in Oct. 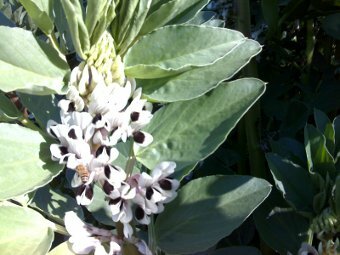 The bees LOVE broad bean flowers. 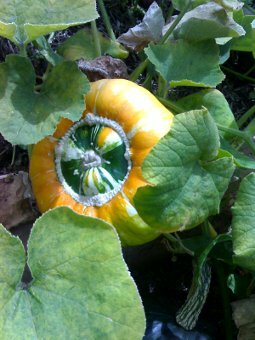 Suzi puts a FIMBY pumpkin to good use! Look closely to spot the dynamite chillies too. 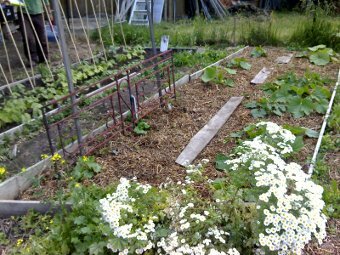 Beautiful baby coriander in Gail's garden in July, just planted in new raised bed. (Left) Dave's new bed looks great in April. 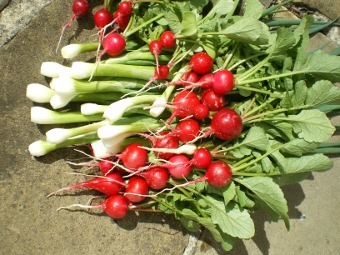 Leeks, beetroot, brassicas, lettuce and soon raspberries. 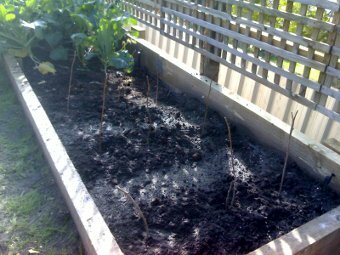 (Above) and here they are; newly planted chilliwack and willamette raspberry canes. 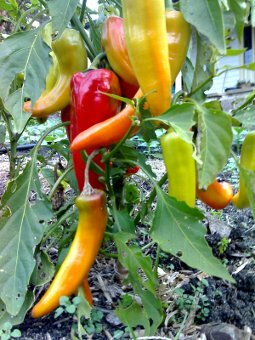 Shortest day of the year, capsicums still ok on the bush. Better pick them or frost will get 'em! Garden construction and artwork brought to you by the tip shop scavengers! Mmmm garlic! 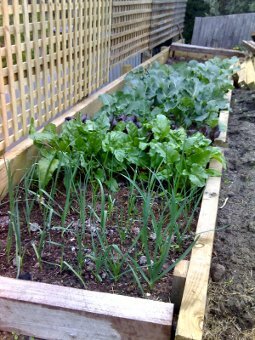 plus spinach in foreground (just babies), and green manure and brassicas behind. 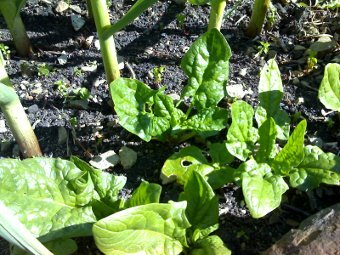 Spinach babies grown a bit, sturdy garlic stems. 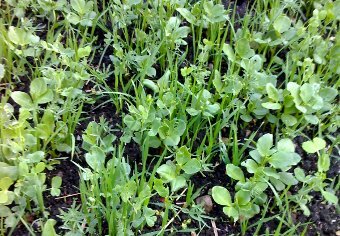 Close up of green manure crop in June 09. 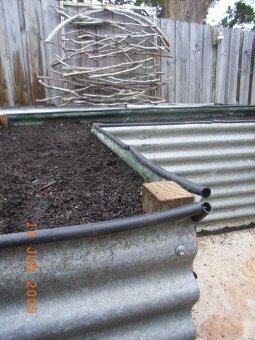 It will add nitrogen and organic matter to the soil. 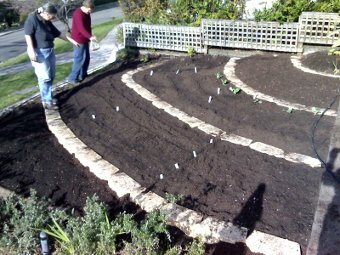 We finally had a sunny day to plant! Juliet and Elizabeth confirming what seed is what. 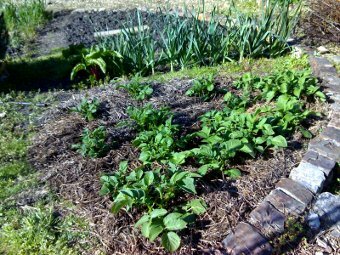 October and spuds are up and mulched. 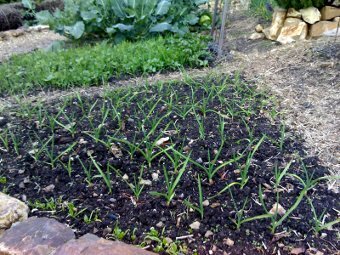 leeks in background are almost starting to send up flowers. 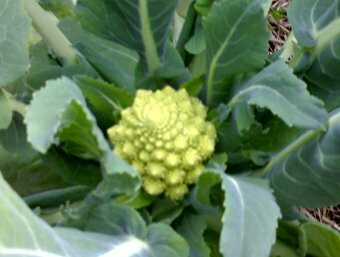 These romanescu broccoli are very fractal. 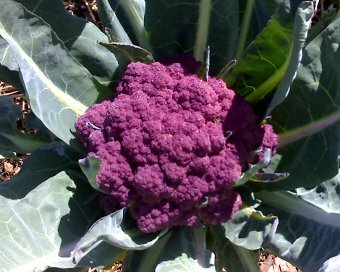 V easy to grow, and taste good too! 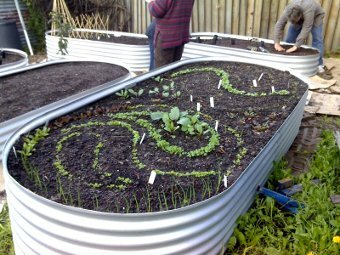 We're delighted to be collaborating with chef Luke Burgess, who uses FIMBY gardeners' excess vegies (and weeds!) in preparations for his amazing gourmet dinner parties. 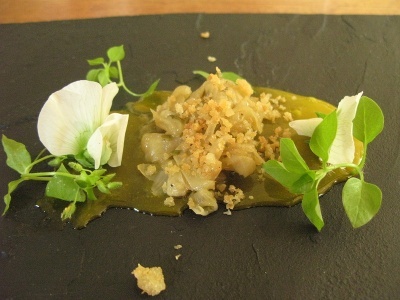 Luke reckons that onions and lovage are a match made in heaven, and in this dish he's used chickweed and pea flowers as a garnish. At Thomas and Wendy's we planted sunflowers amongst the beans. 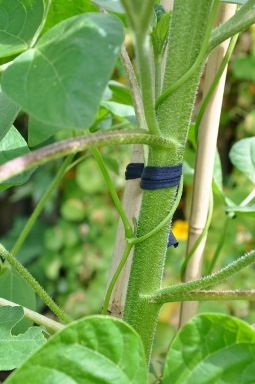 They're happy companions, with the beans using the sunflower stems to climb. 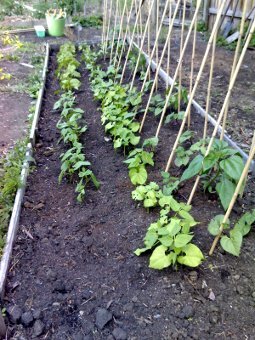 Then beans are growing well, and the 6 foot sunnies are gorgeous and enjoy the nitrogen fix from the beans. 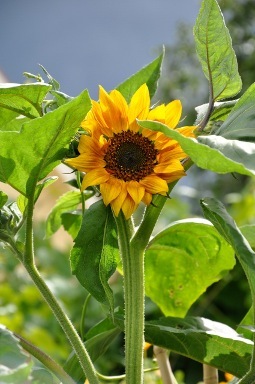 Another sunflower shot - this time from Carol. Drive up Gourlay St to see these amazing giants! David's beans all in a row . . . 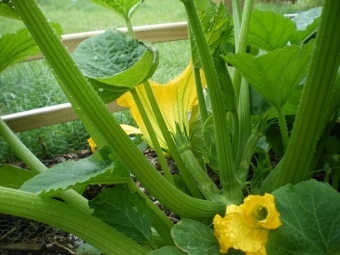 Bees in the giant pumpkin flower. Go bees! Shelly and Talia hard at work / play! Wendy &Thomas's jungle - you can hide in it now! 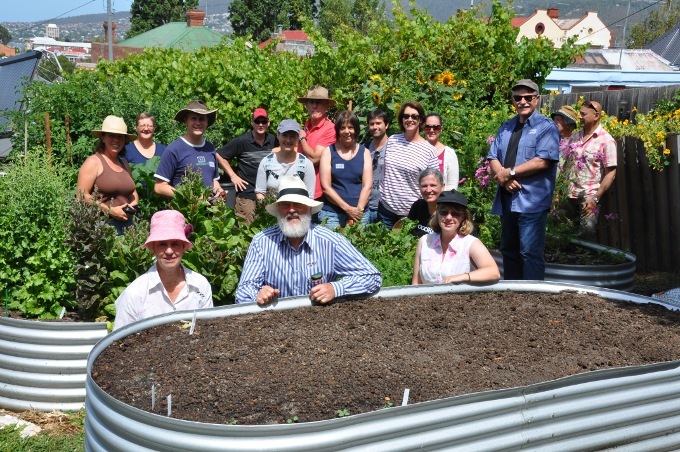 Our inaugural garden tour was great fun. Here we're doing gnome impressions. 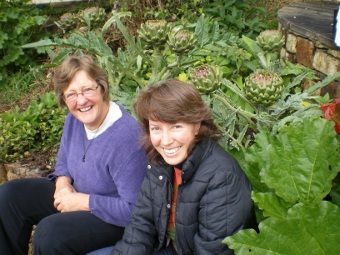 Jackie and Tina - gardeners par excellence. 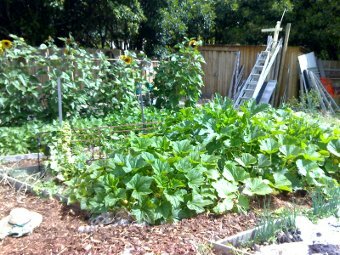 Dave's cucurbit bed and beans in December 09 Same beds only 6 weeks later in Jan 2010. 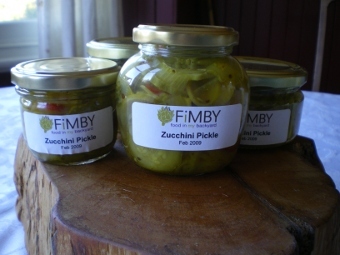 (Above) Some of the pickles we made. This is about a quarter of the haul from about 20kg of zucchini. Vanessa's capsicums in Feb - lookin good. I'm getting garden envy. Beaturiful cluster of baby red pear tomatoes from Vanessa and her macro lens. Nice shots! 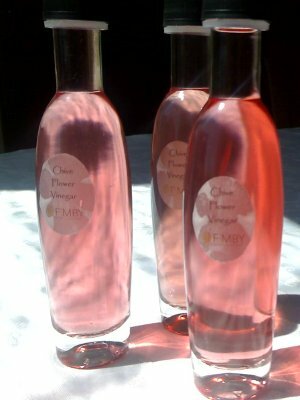 Chive flower vinegar - easy to make, yummy. 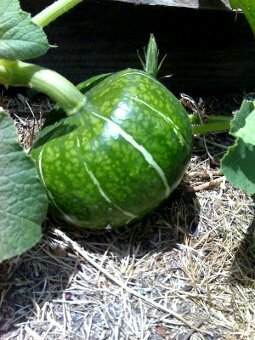 Turks turban pumpkins - so pretty!